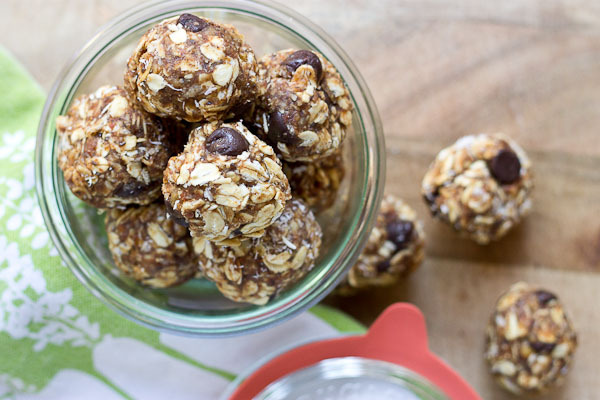 Almond Butter Energy Bites… made with wholesome ingredients like almond butter, dates, dark chocolate and oats. Perfect for snack time or a super quick breakfast! Vegan. Gluten Free. It’s Monday.. where did the weekend go? I love the weekends because we get to all be together as a family.. and then Monday hits and it’s back to work. Eric and I had a fun weekend… I went to a baby shower for a good family friend on Saturday. Something must be in the water because everyone is having babies now! So special that we’re all going through this new phase of life together. Since it’s Monday I’ll keep it brief. 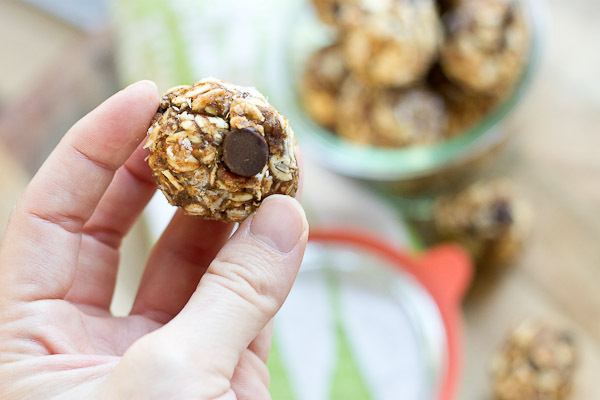 I have these delicious Almond Butter Energy Bites for you today that are made with wholesome ingredients. They are so simple.. just pop all the ingredients in the food processor or blender and roll them into balls. 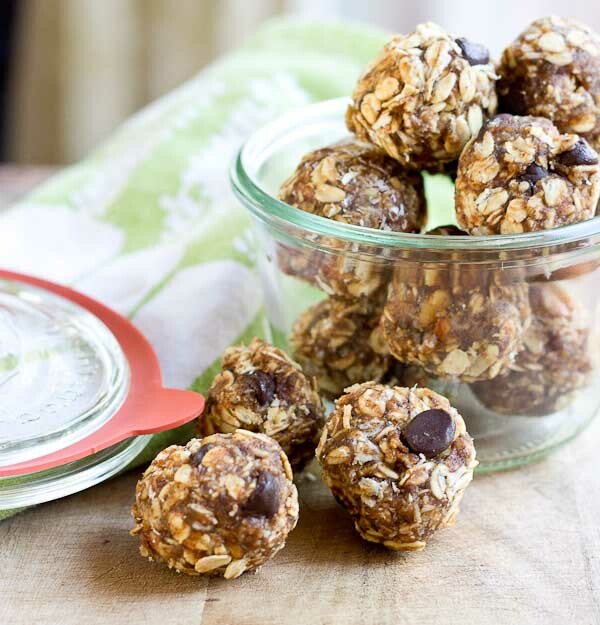 Almond Butter Energy Bites… made with wholesome ingredients like almond butter, dates, dark chocolate and oats. Perfect for snack time or a super quick breakfast! 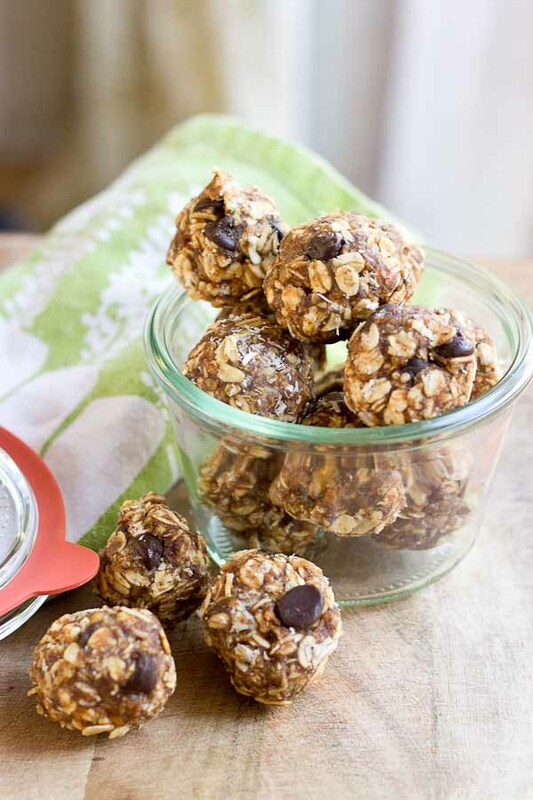 In the bowl of a food processor or blender, chop almonds and chocolate chips for a couple seconds. Pour into large bowl. Process dates in food processor or blender. Add coconut oil, almond butter, flax, chia and vanilla extract to bowl and process until smooth. Pour date mixture into large bowl with almonds and chocolate chips and mix until combined. Stir in oats. Roll dough into 16 uniform energy bites. Great recipe. Exactly what I was looking for. My question is for how long to cook and in what temperature? Thanks Kay! This is a no-bake recipe so once you mix it and roll them into balls they are ready to eat!